This is Emirates’ 24th consecutive year of profit, during which it reached a milestone of carrying its 34 millionth passenger. THE EMIRATES GROUP has announced its 24th consecutive year of profit, making $629 million net profit according to its 2011 – 2012 annual report. It said today that it had seen companywide growth “amidst unprecedented economic pressure and record high fuel prices”. The group’s 2011-12 annual report shows it posted a US$ 629 million net profit, with dnata marking its highest ever profit in 52 years of operation. The group’s revenue reached a record high, climbing to US$18.4 billion, an increase of 17.8 per cent on last year’s results. Achieving our 24th consecutive year of profit and maintaining an upward growth trajectory is an achievement that belies the industry norm. Throughout the 2011-12 financial year the Group has collectively invested close to US$3.8 billion in new products. This investment has garnered new customers and increased our international presence. Successful business growth is not a matter of luck, it is the result of sustained and calculated investment. Every dirham that we earn is strategically ploughed back into our business and it is this foresight that has allowed the Group to maintain such strong and consistent profitability. During the year, Emirates received 22 new aircraft and added 11 new destinations while increasing capacity to 34 cities. Meanwhile, dnata gained a majority stake in online travel agency, Travel Republic Ltd and a 50 percent interest in Wings Inflight Services in South Africa. Emirates’ fuel bill increased by 44.4 percent over last year to reach US$ 6.6 billion. With operating costs increasing by 24 per cent compared to a revenue increase of 16.2 per cent over last year, Emirates bore the brunt of the cost of fuel for nearly one year, before reluctantly introducing a fuel surcharge on all tickets. Emirates also had an operationally challenging year with the political unrest across the Middle East and North Africa affecting flight schedules. Emirates launched its highly successful US$ 1 billion bond in June last year, which was well received by global investors. In addition to this, it repaid a Singapore Dollar 250 million bond in full that matured in June 2011. We move into the new financial year with cautious optimism, navigating our way through the difficult economic climate with a clear vision for our continued success. We understand that succeeding in this industry requires determination and we are unapologetic about our drive to be the best. East Asia and Australasia remained the highest revenue contributing region for the group, with US$ 5.0 billion up 17.6 percent from 2010-11. Europe, up 18.2 percent to US$ 4.6 billion and the Americas up 21.3 percent to US$ 1.8 billion also saw significant growth. Across the rest of the globe Emirates saw strong revenue increases from West Asia and the Indian Ocean up 10.6 per cent to US$ 1.9 billion; Gulf, Middle East and Iran up 15.1 per cent to US$ 1.7 billion; and Africa with AED 6.1 billion in revenue, up 9.5 per cent. The company also saw an upward trend in its premium class seat factor for a second year, while premium and overall seat factor for the airline’s flagshipA380 aircraft sat even higher. 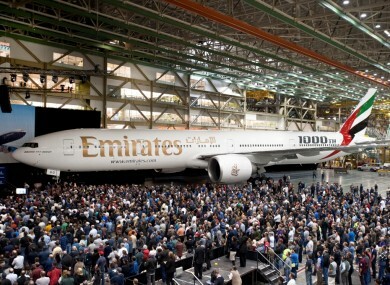 As of 31 March 2012, the Emirates Group and its subsidiaries employed 63,000 staff, representing over 160 different nationalities. Email “Emirates announces $629million annual profit ”. Feedback on “Emirates announces $629million annual profit ”.